Hi! Today we’re going to use some stuff we learned about a long time ago (non-Euclidean geometry, manifolds, and groups) and put it together to explore a particular group. This is based on a talk given by my dear friend and co-organizer Michelle Chu. “Co-organizer? Of what?” you ask. Well thanks for asking! Last weekend we did held the first Texas Women in Mathematics Symposium – we had over 60 people come, lots of talks, lots of networking, and lots of food. By the end of the day I got to add “annual” to that description, and it seems like a lot of schools were interested in hosting it in future years. Maybe some time I’ll write a post about how to found an annual conference (this is my second!). Start with the pink triangle, and reflect it over each of the three sides to make the colored triangles as shown. Now do the reflections again. I kept the pink base triangle and grayed out the first images. Note that I colored the bottom left image yellow, for reflecting over the vertical side of the bottom orange triangle, but I also could color it orange, for reflecting over the horizontal side of the left yellow triangle. This means that yellow+orange = orange+yellow in the group. Similarly there are only a few (relatively) that tile the sphere: (2,3,3), (2,3,4), (2,3,5), and (2,2, n), where n is some number bigger than 1. Of course this forms an infinite family of tilings, since you can choose n. In the example above I chose n=5, and if n is bigger the base pink triangle just gets skinnier. Let’s bring us back to groups. How does a tiling of a space lead to a group? Well, let the reflections over the (extended) sides of the base triangle be the generators of our group. If I name these a, b, and c, I immediately get the relators . Next we have to figure out the rest of the relators. I hinted at them in the pictures above. They are . Now we have a group presentation [link for definition] . Also, fun coincidence: if you create the dual tree to the tiling by putting a vertex inside each triangle and connecting two vertices by a line if one triangle is the image of another under one of the reflections, you get something that looks a lot like the Cayley graph of the reflection triangle group. The only difference is that each edge needs to be two edges (like a little loop) to reflect that each generator has order 2. Maybe we’ll take a second here to point out that you can see the p, q, r values in the tilings, both in this picture and the other wikipedia picture above for (2,3,6): pick your favorite triangle, and look at its three vertices. Each vertex is adjacent to n other triangles, and since there are angle around any vertex, we can figure out that p,q,r are just . So we maximize something with the numbers 2, 3, 7. Well it turns out we do more than that- we also minimize the volume of the resulting quotient-we touched on and defined those in this post about manifolds. And this is unique (up to conjugation/fiddling), and makes the smallest possible quotient. Huzzah! On a personal note, I’ve had a demonic cold keeping me in bed for the past two weeks, so forgive me if I messed up (pretty sure I did on the reflections; I’ll try to fix those soon). Also, hope you voted today! I voted a week and a half ago. UPDATED: Thanks to my dear friend Teddy (who hasn’t updated his website and is at Cornell now, not UCSB), I’ve made the converse direction of the proof more correct. There’s definitely still a glaring defect, but that’s entirely my fault. This is out of character for this blog- it’s not accessible for most people. If you have taken a course in algebraic topology, you can read this post and I’ll explain everything. Otherwise, I’m not offering enough background to understand it. Sorry! Blame pregnancy! I’ve been spending the past few months slowly slogging through a big paper that my advisor recently cowrote, on an alternative proof of Wise’s Malnormal Special Quotient Theorem. In the paper they spend a few paragraphs explaining Scott’s Criterion for separability, from Scott’s 1978 paper (need access for this). I did not understand it when reading, but after meeting with my advisor and drawing some pictures it made a lot more sense! 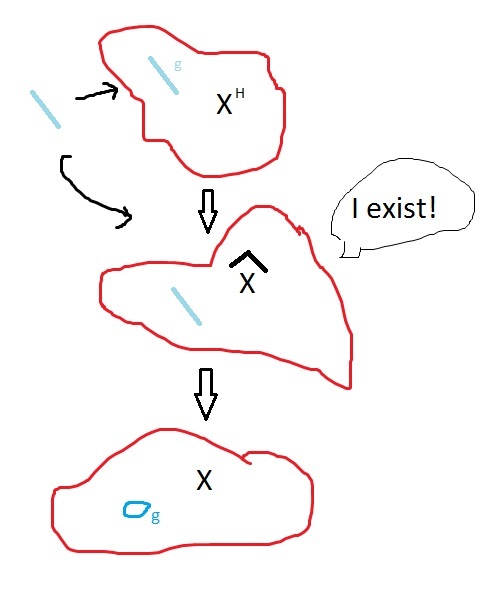 So I’m going to draw some pictures for anyone trying to understand this- probably other graduate students. Here’s the theorem as it appears in the MSQT paper. Theorem (Scott, 1978) Suppose X is a connected complex and . Then H is separable in if and only if for every finite subcomplex , there exists an intermediate finite degree cover such that A embeds in . Okay let’s unpack the theorem. First we need to say what it means for a subgroup to be separable: H is separable in G if, whenever you pick an element g which is not in H, there exists some finite index subgroup K of G so that H is contained in K and g isn’t contained in K. Intuitively, you can “separate” H from g via some finite index subgroup. There are other equivalent definitions, but this is the one we’re going with. Recall that a finite degree cover is a covering space where each point in X has finitely many preimages. Notation wise, just means the cover of X corresponding to H, so that . Also, recall that an embedding is an injective homeomorphism onto the image of the map. So, for instance, a circle definitely embeds into the middle cover above, but not into the infinite one. You can map a circle injectively to a subset of the real line, say to [0,1), but it’s not a homeomorphism where the two ends meet. And by connected complex let’s say CW-complex. Okay it’s proof time! For notation we’re going to let . Suppose that the condition is met, and we want to show that H is separable. Take an element g not in H. Since G is the fundamental group of X, g corresponds to a (class of homotopy equivalent) loop(s) in X. Since g isn’t in H, it isn’t a loop in $latex X^H$- let’s say it’s a line segment. By the condition, since this line segment is a compact subset of , there exists some intermediate finite degree cover so that the line segment embeds into it. This finite degree cover corresponds to a finite degree subgroup K. Since is intermediate, H is contained in K. So H is separable. Okay let’s do from the other side now. Suppose H is a separable subgroup of G. Pick a finite subcomplex A of H (the actual criterion just says compact, but we’re sticking with finite). Look at all the elements of G which have preimages in A- since A is finite, we only have finitely many of these. For any given $latex g_i$, since H is separable we have a finite index subgroup which doesn’t include and which contains H.
I guess we still need to show A embeds- do you believe me that it does? I’m not sure I believe me. Now if we want an intermediate cover into which A embeds, it can’t include any elements of G that send D to itself- that is, if , we don’t want g in . Because then A wouldn’t embed. How many bad g are there? Well, since deck transformations act properly discontinuously, for any point in there’s an open neighborhood that never gets sent to itself (besides when g is the identity, of course). And we’re in CW-complexes, so we mean an open cell. Look at the other cells of this particular component of D. Again by proper discontinuity, there’s only finitely many g that’ll send this to some other copy of D.
Since H is separable, for any one of these g we have a finite index subgroup K that doesn’t include g and which does contain H. Take the intersection of all these subgroups– since they all contain H, this intersection (call it K) does too. And K doesn’t include any of the bad g. Back in topology-land, K corresponds to a finite degree cover of X, since the intersection of finitely many finite-index subgroups has finite index. And this cover is intermediate by construction, and A embeds in it since there aren’t any bad g.
And that’s a proof of Scott’s criterion! My next blog post will either be baking/cooking or a reasonable math post.